This is a trail that was started in 1990 and was completed in 2002. The plan was to construct a 13 section, 250km walking trail along the spine of the Macdonnell Ranges from Alice Springs, west to the end of the range. The last section from Redbank Gorge over Mt Razorback has been abandoned (there are problems with access as it is a remote location with no close road) and the resulting 12 section trail is now complete. The track follows a desert range with sweeping views of barren landscapes with colourful rocks. 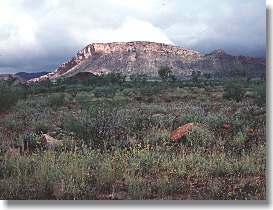 The track visits the major tourist features like Simpsons Gap, Standley Chasm and Ormiston Gorge as well as many other features along the range. While most would think a desert walk to be barren, there are trees and bushes, deep shady gorges and pockets of lush plants. Of course, there is also plenty of spinifex (a very tough spiky desert grass) and barren ridges. The walk is completed. Some of the track crosses private land and any special directions should be followed. This one of Australia's best long walks as the scenery is excellent. Campsites with semi-permanent water have been established at the end of most sections. The track starts at Alice Springs and runs west. Alice Springs is the only large town in the southern half of the Northern Territory. Geographically, this is close enough to being in the centre of Australia. Alice Springs is located on the major bus route from Darwin to Adelaide and has many regular services. The town also has a large busy airport which commercial airlines use every day. The town has all the usual facilities of a tourist place with car hire, charter buses and tours. There are no regular public transport services to the track. Charter bus transport runs to all major access points and these also will place your food drops. The most popular food drop locations are Standley Chasm kiosk (this is a private business so a donation or present to the owners is suggested), a locked steel bin tied to a tree at Ellery Creek and a room at Ormiston Gorge. It is also possible to do shorter sections of the trail and Standley Chasm to Alice Springs is suggested as an easy to organise 5 day walk. Standley Chasm can be reached by charter transport, on some tour groups or by taxi as the road is sealed and the kiosk has a telephone. The trail can be walked in either direction. 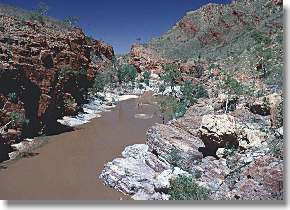 Redbank Gorge to Alice Springs (west to east) is popular with end-to-enders as it requires hire of charter transport only once as the food drops are done on the drive out to Redbank Gorge. Groups walking shorter sections often walk from east to west as the climbs are less steep. The Parks and Wildlife Commission of the Northern Territory (what a mouthful) publish a set of map and track notes to each section of the track in a simple brochure format and these can be purchased on the web at Parks & Wildlife - Larapinta Trail. The only other map is the 1:100,000 NATMAP Alice Springs, which only covers about 1/4 of the range and does not show the track. The other alternative is a 1:250,000 NATMAP which we used on our first visit - it has minimal detail and is not ideal for bushwalking (it is fine as a driving map). We have completed a Larapinta Trail guide book which is an all colour book with colour 1:50,000 topographic maps of the trail and it includes full track notes for both directions. This is now in its second edition. Commercial walking tours are available for the trail - most trips just complete some sections with two companies each running one end to end trip a year. A - Day 2, continue 2.5 hours further to Rocky Bar Lookout (called Hilltop Lookout by parks), then next day direct to Ormiston Gorge (skip Glen Helen), 18km, 6.5 hours. C - Day 9, continue 3 hours further to Ghost Gum Flat (easy almost flat walking) then next day through to Hugh Gorge Junction or Razorback Camp. D - Combine day 13 and 14 by picking up water at Birthday Waterhole and camping in Stuarts Pass, next day walk through to Standley Chasm. This misses the superb high camp on Brinkley Bluff (best missed if weather is poor). E- Day 16, continue 1 hour further to camp in creek south of Arenge Bluff at Arenge View then next day go through to Wallaby Gap - as Simpsons Gorge campsite is presently rough gravel, this is a reasonable option. Total length - 19 days or 14 days if all combinations as above are done. Of course other alternatives are possible. None are needed for the trail itself. Fees apply to camping at Ormiston Gorge and also fees apply to both enter and camp in the privately owned Standley Chasm area. This is a hot area for most of the year and a visit during the cooler winter months from April to September is suggested - see the Weather Charts. Photographs and text are copyright � 1998-2015 John Chapman.